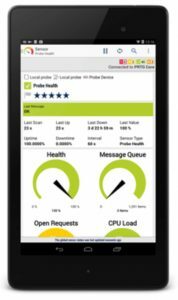 Gain visibility of your own network in real time on PCs, tablets and smartphones. The Fourteen IP EVOLUTION Monitoring enables practically any of your hotel’s IP end points to be monitored 24 hours a day, 365 days a year. Whether you want to know the status of your servers, PC’s, IPTV system or even your IP enabled fridge, the Fourteen IP Network Operations Centre (NOC) is constantly watching over your devices. Very often our engineers will be aware of a fault before you are. In addition EVOLUTION Monitoring gives you and your staff the ability to monitor your own network in real time. The application provided can be used on PCs, tablets and smartphones. It can be downloaded for free and when configured with the information provided by Fourteen IP allows your staff to view information and receive alarms on practically any monitored IP end point. All of our managed services are designed and installed by our uniquely experienced and qualified hospitality engineering team, who monitor our services 24/7/365 and provide technical support across Europe and The Americas. Fourteen IP offers on-site support for all our customers with 24×7 support for all major faults and a16 hour fix for all standard faults. The Fourteen IP helpdesk runs 24/7/365. On weekdays during office hours calls are answered by our service desk and calls are passed directly to our technicians to clear faults or carry out remote moves and changes. Outside of office hours and at weekends call are answered by our call centre who will take the fault details and either resolve the fault remotely or pass directly to an engineer to resolve remotely or attend site. In the case of a third party fault they will contact the third party supplier, report the fault and then chase them on behalf of our customer until resolved. Looking for peace of mind when it comes to your networks and IP devices? Get sound advise from a company that specialises in hospitality communications – talk to Fourteen IP.